A member of the public found the dead bird of prey in Castle Douglas in January. 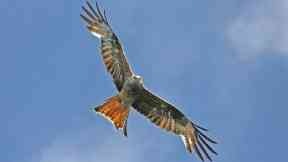 Red Kite: Found to be poisoned. A red kite has been found poisoned to death in Castle Douglas. A member of the public found the bird of prey in the Durham Hill Lane area, Kirkpatrick Durham, on Saturday, January 20. After further examination, the red kite's remains indicate it had been poisoned. Police Scotland are carrying out enquiries to the circumstances surrounding the death of the bird. Specialist wildlife crime officer constable Alan Steel said: "Due to the inherent scavenging nature of red kites, they are particularly vulnerable to the illegal use of poisonous bait. "Red kites are legally protected and Police Scotland works closely with partner agencies, including the Scottish Agricultural College, Science and Advice for Scottish Agriculture and the Royal Society for the Protection of Birds to ensure that those responsible are brought to justice." RSPB Scotland's head of investigations said this case is of serious concern. "The Galloway Red Kite trail, just a few miles from where this bird was killed, is a popular tourist attraction and of great benefit to the local economy," he said. "The indiscriminate use of illegal poisons doesn't just affect wildlife but is a significant risk to pets and people as well, and we join with the police in asking that anyone who can provide information about this incident comes forward." Anyone who with any information is asked to contact Police Scotland on 101, quoting reference number PDG 0014800118.